UPDATE: Since I wrote this post last week, on November 25th, events swiftly unfolded to underscore the points I made in criticism of Reid Hoffman’s views on venture capital, in his interview with the MIT Technology Review. 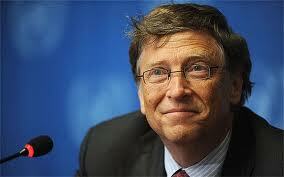 Bill Gates and a host of global leaders, Silicon Valley industry leaders, and high-tech billionaires announced the Clean Tech Initiative, at the opening of the UN COP21 Climate Change Conference. This initiative precisely makes my point that venture capitalists like Reid Hoffman fail to see their social responsibility, or to examine the ethics of their investments. At the time I wrote the opening paragraph to this post (below), I had absolutely no idea that my points would be validated by Bill Gates, Obama, and high-tech industry leaders Meg Whitman of HP, Facebook Chief Executive Officer Mark Zuckerberg, Alibaba Chairman Jack Ma, Amazon CEO Jeff Bezos, Ratan Tata, retired chairman of India’s Tata Sons, the holding company of the Tata group, and South African billionaire Patrice Motsepe of African Rainbow Minerals. I would now go so far to say that Hoffman’s views are an embarrassment to himself in the face of the vision of others. 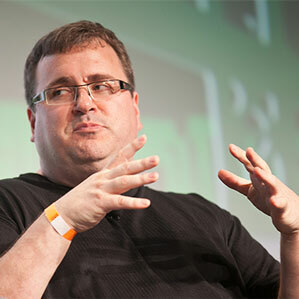 An insightful interview with Reid Hoffman, venture capitalist and founder of LinkedIn. But to my mind, Hoffman seems blase’ about Big Ideas and “deep tech” funding. I share the views of Startup Genome founder, Max Marmer, and bemoan the limited focus of VC’s on world-changing technologies, leaving it to billionaire angels. I also sense a myopia about the ongoing intense debate over the distortion of the sharing economy by Uber, Airbnb, and others. Thanks to Gary Reischel for posting this article on his Facebook page. My attention is focused on two privately funded Big Idea entrepreneurial ventures in Vancouver B.C., General Fusion, and D-Wave. General Fusion and at least two other companies in California and Germany are competing against the two massively funded governmental nuclear fusion projects, ITER at Cadarache in France, and The National Ignition Facility at the U.S. Department of Energy’s Livermore National Labs. D-Wave, is pioneering quantum computing, having successfully sold two early quantum computers to Google and Lockheed Martin/NASA in Silicon Valley. Read More mayo615: Are Venture Capitalists and Big Ideas Converging Again? Reid Hoffman has worked the entire tech startup ecosystem: he cofounded LinkedIn in 2002, used the money he made there to become one of Silicon Valley’s most prolific angel investors, invested early in Facebook, Zynga, and many others, and is now a venture capitalist at Greylock Partners. At Greylock, which he joined in 2009, Hoffman has focused his investments on consumer Internet companies that use software to create networks of millions of users, such as the home-sharing site Airbnb. Startup incubators that nurture entrepreneurs’ early ideas, super-angels who invest small amounts in large numbers of early-stage companies, and project crowdfunding via Internet sites such as Kickstarter are all presenting alternatives to traditional VCs. Hoffman thinks firms like his can compete by providing services such as dedicated teams that recruit engineers and holding dozens of networking and educational events to help startups get big faster. He’s currently teaching a Stanford University class for entrepreneurs in “blitzscaling,” his term for the rapid scaling up of startups. Hoffman spoke with MIT Technology Review contributing editor Robert Hof about why that’s especially important today and whether enough investing is being done in core technologies such as computer science, networking, and semiconductors. How have changes in technology altered the way you invest? Starting a software company is now a lot cheaper and faster than it used to be, thanks to Amazon Web Services, open-source software, and the ability to build an app on iOS or Android. Speed to realizing a global opportunity is more critical competitively. I wanted to build out a [venture capital] platform that was appropriate to the modern age of entrepreneurship. VCs have always provided help on networking and hiring. How is your platform different? Think about how an application gets built on iOS. It calls up services on Apple’s platform, such as a graphics framework or how to create a dialog box. Similarly, a business gets built by hiring people, developing its product or service, growing its revenues. The modern venture firm needs to provide a set of services that the company can call upon. We have a dedicated team to recruit engineers and product people. We have more than a dozen communities of people from big Valley companies like Apple and Facebook focused on technical topics such as big data and user growth. They meet with our companies to teach things like growth hacking, the use of social media, and other low-cost alternatives for marketing. How long will these software-driven networks you’re focused on be good investing opportunities? There are still billions of people coming online. Also, software is affecting almost every industry, from transportation, with Uber and self-driving cars, to personalized medicine, health, and genetics. And we’re just beginning to see how data informs everything. Those trends are in the very early innings, so they’re the ones that will have the macroeconomic impact over the next five to 10 years. You’ve said you don’t think there’s a bubble in tech investing, but surely not all these upstarts are worth so much? People are so exuberant about finding their way to the cutting-edge companies that valuations are going up across the board. Some companies are so massively valuable that even when you invest in them at an accelerated valuation, they’re still cheap in retrospect. But many companies are given [high] valuations when they actually shouldn’t be. I don’t think higher valuations in private [venture capital fund-raising] rounds lead to a massive [public] market correction. A private down round [fund-raising that values the company at a lesser amount than the previous round] doesn’t destabilize the public capital markets. But it’s still pretty frothy. So when you’re seeing inflated valuations, you sit it out. Have you been sitting out more often? We’ve passed on many more deals in the past two years. Is true innovation beyond slick apps being financed to the extent it should? Markets tend to go toward realizable, short-term rewards that require little capital. That tends to favor pure-play software companies like Airbnb, Dropbox, and Uber that have global reach and network effects [in which a service becomes much more valuable as more people use it]. If more capital naturally flowed toward deep tech, I think that would be a good thing for the world. But you do have SpaceX, you do have Tesla. Deep tech isn’t that starved for capital. VC investing is way up, but the traditional exit, the IPO, often comes after a company has already grown quite large. As a result, public investors, as well as employees don’t share as much of the increase in value. Is that a problem? It used to be, back in 1993–’96, tech companies would go public and then public market shareholders would benefit from the huge growth in valuations. Now it’s more the private investors who benefit. I don’t think that’s necessarily a problem. Doesn’t that go against the idea that employee stock options and so on will democratize wealth, or at least spread it more broadly? Ideally, you’d like to make the capital returns available to everybody, not just to the folks who can participate in these elite private funds or elite private financings. I’d rather have it democratized. But on the other hand, it makes complete sense from a company perspective to delay liquidity, because they can run much more efficiently as a private company and get as much momentum as possible.